Xara3D has been Xara's most successful title (in terms of quantity sold) and many people are introduced to Xara by this product. 3D software is typically among the most complex to be found, but not Xara3D. We call it 'simpleware' and think it's the easiest 3D software ever created. Check out the Xara3D movie page that shows the latest Xara3D (v6) in action, and a second movie showing Xara3D being used with Xara Xtreme. 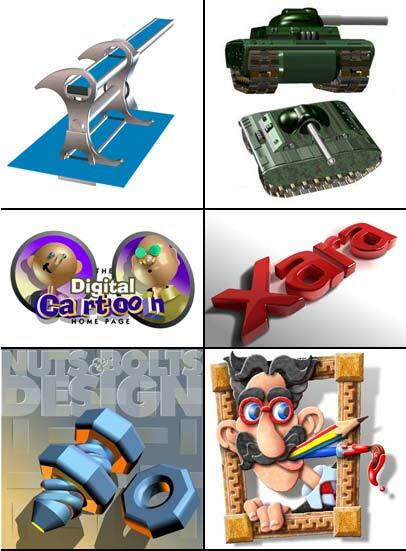 Creating 3D logos and extruding 2D vector designs from Xara Xtreme really can be done in minutes. Offer: We've got a very special offer to go with this month's 3D theme: Xara3D version 5 (the previous version) - now just $14 but this lasts ONLY until the 27th August. The latest version, V6, costs just $45 (plus any applicable tax and shipping), more details here but - hint, hint - look out for special deals on all our current titles over the bank holiday weekend (24th-27th August). Continuing on the 3D theme we have a rather unusual website plug-in, that allows you to easily add your own 3D heading maker to any website. It's free, so if you want to liven up your website with this web based 3D heading maker, read here for more info. At last Xara Xtreme and Xtreme Pro 3.2 CDs are in stock and all back-orders have been cleared, so most of you will have received your copies by now, or will do so imminently. This month we have some examples of 3D illustrations created in both Xara3D and Xtreme. The Xara Xtreme Live Effect feature lets you use Photoshop plug-ins with vector graphics. What's more they remain completely live and editable. So these examples, produced with the glass effect from the Xenofex 2 plug-in collection, can be applied to any vector object or text and you can still edit the image - the lightning effect is automatically re-applied to the or shape after you've edited. The Xenofex 2 collection of 14 plug-ins is normally sold by Alien Skin for $129, but we've negotiated a discount for all Xara registered users, so you can purchase this for just $59! 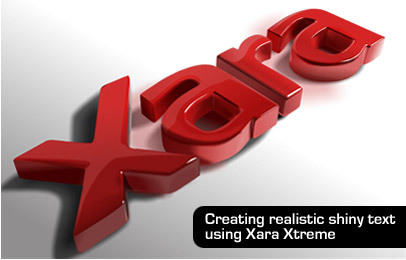 Xara Xtreme smoothes all bitmap rendering, which provides a higher quality display when zoomed into bitmaps. But sometimes you need to see the actual pixels of your bitmap. This is easy - just turn the View quality control slider (on the top bar) down one notch. This turns anti-aliasing off for all vector graphics, but also turns bitmap smoothing off so you can see the actual pixels more clearly. Perhaps one of the least known features of Xtreme is that you can set a bitmap to never be smoothed when enlarged or zoomed in (even with full anti-aliasing on). Open the bitmap gallery, right click on the bitmap and select Properties. There's a check-box that says 'never smooth'. When selected, the bitmap will always show the raw pixels when enlarged or zoomed in. Don't forget that all copies of Xara Graphic Studio (Xtreme + Webstyle + Xara3D) purchased during the month of August include the complete Webstyle Template Pack bundle for free, worth $50. Find out more on the Graphic Studio homepage. Do you use MS Word, or an alternative word processor? 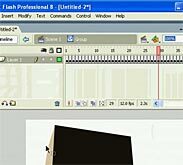 Xara3D user Availor shows how to create 3D animated shapes for use in Flash.